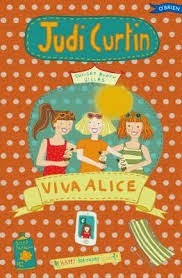 BleachHouseLibrary.ie: "Viva Alice" by Judi Curtin - Guest review by Jane Roe, aged 10. "Viva Alice" by Judi Curtin - Guest review by Jane Roe, aged 10. This book is about thirteen year old Megan and her exciting best friend, Alice. It's sort of Megan's diary. Megan and Alice are invited to go to Lanzarote their friend, Grace. They're having fun in the pool, having barbeques and taking in the sun. Alice can't resist sorting out Grace's brother, Gavin's, love-life. Megan must go along with Alice's overboard plans, even if they do involve mean girl, Melissa. This is my first Alice and Megan book. I wasn't too sure about reading it at first, but I now I am eager to read the other books in the series. Viva Alice is published by O'Brien Press and is available in paperback or ebook format.